Vegetable Market Burgas is the first one meeting all EU standards. 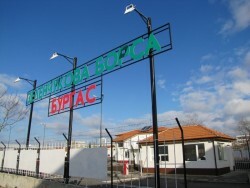 It is located on an area of 16 acres in the modernizing industrial zone of Burgas. The modern vegetable market is licensed by the State Commission on Commodity Exchanges and Wholesale Markets. It offers 3500 m2 covered areas. The premises are equipped with all facilities needed for wholesale. The investment in the most modern Bulgarian marketplace for sale of fruits and vegetables is entirely onside a Burgas company and exceeds 1,200,000 euros. Burgas has acquired an extremely useful acquisition in the trade realm.